How is DePauw Student Government organized? Executive Board sets the goals and direction of DePauw Student Government. The Board is made up of nine elected officials. Senate Chamber aims to establish a direct line of communication between the student body and DePauw Student Government by soliciting campus input and concerns and relaying DSG updates their respected classed. The Senate is composed of twenty elected senators—five elected senators represent each of the four classes. Representatives Chamber works to represent the needs, desires, and voices of the student organizations. Representatives collaborate with the Senate Chamber to achieve the goals of DePauw Student Government and pass legislation. Any student organization can choose to sponsor a student representative. Allocations Board is responsible for distributing the Student Activity Fee to student organizations and administrative offices. 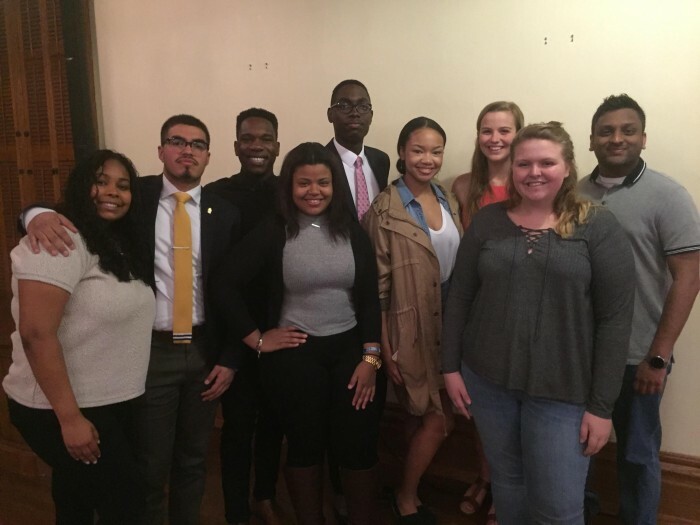 The Board consists of nine students—three appointed by the Vice President of Finance and six elected by the student organizations representatives. General Assembly provides an opportunity for all bodies of student government and recognized student organizations to meet, collaborate, and discuss current issues and concerns. DePauw Student Government recognized student organizations are responsible for selecting one student to represent their organization at the monthly Assembly Meetings who are responsible for voicing specific student concerns and acting as the liaison between their student organization and DePauw Student Government. Meetings of the General Assembly, Representatives Chamber, and Senate Chamber are open to the public. All students have the right to voice-without-vote at these meetings. I missed a meeting, how can I stay up to date on what DSG is doing? You can find DePauw Student Government meeting minutes, white papers and press releases on our UPDATES page. When are DePauw Student Government elections? Find more information on upcoming elections on our ELECTIONS page.